ANBAD had technical difficulties on Wednesday, and couldn’t publish the Midweek Mixtape. 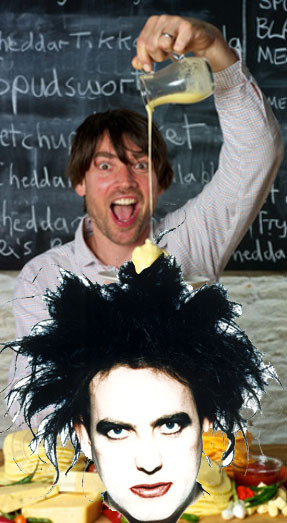 But a week without a petty jab at Alex James from Blur is a week without sunshine, and – as he has become the primary reason for the existence of this column now – I’m always happy to oblige. Alex has found that he is, indeed, enjoying his new temporary home on Friday; and, moreover, is In Love with this day. And yes, this preamble is all just a way of crow-barring a photo of him pouring cheese onto Robert Smith’s disembodied head onto ANBAD. FIRST! Another suggestion courtesy of long-time ANBAD Suggester Of Good Bands, photographer Gareth Hacking, who discovered Intensive Care on his travels, and like any good tourist, brought some of them home with him. SECOND! Are Family Of The Year a new enough band or not for inclusion on ANBAD? Who cares, when they’re making such lovely and admirably foul-mouthed folk songs like The Stairs? Ace. FOURTH! Little Legend round out a RAWK-flavoured Mixtape – and how: Saints is top-notch by anyone’s standards. Unabashed, gutsy and satisfying. Posted on April 6, 2012 by Joe Sparrow. This entry was posted in Headline, Today's New Band. Bookmark the permalink. MIDWEEK MIXTAPE // 11th April 2012 | A New Band A Day!